The Value of Simple describes the investing process in a way anyone can follow, from creating a plan through opening an account to purchasing investments. By focusing on implementation and minimizing complexity, this plain language quick-start guide will get investors started on the right path, with the tools they need to stay on track. Though many Canadians want to take control of their finances and start investing on their own to save fees, the reality is that they simply do not. There are many reasons for this inaction, but they tend to boil down to a lack of knowledge, a lack of time, or a lack of confidence. The Value of Simple addresses all three by laying out a simple strategy that removes the complexity and chance for human error, with light-hearted, easy-to-understand explanations of the investing world, and a look at the screens you’ll face using a bank or brokerage on your own. With a step-by-step approach, it makes creating and implementing a successful financial plan easy, while the tools and templates minimize the time required to stay on track. From effectively communicating the knowledge needed to build confidence, to the light touches like the large, friendly letters spelling out “DON’T PANIC” at the front, The Value of Simple helps investors break through their inertia and get started quickly. The awareness of Canada’s high mutual fund fees and how those can impact performance is spreading, as is interest in investing in index funds and ETFs. There is a plethora of information available on index investing, with many great arguments for why it should be the strategy of choice, and information on what to buy, but people are left hanging when it comes to how to invest. For the average investor, a low-cost index investing approach is the easiest and simplest way to get your money working for you for long-term success. 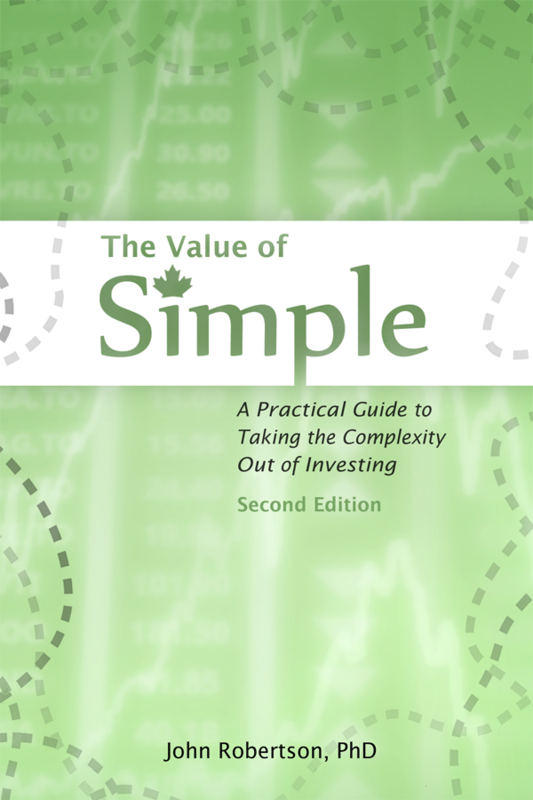 The Value of Simple is a guide that speaks in plain language and provides the follow-through instructions you need to take action and actually start investing. Good processes are critical for long-term success. The book walks investors through the elements of managing their finances for the long term: how they can determine an appropriate asset allocation for their situation, devise a savings plan, stick to it through automation, track their investments, and deal with the inevitable issue of taxation. In all cases, the book recognizes the value in keeping things as simple as possible, and introduces gradual increments of complexity only where doing so can help readers save enough money to justify the effort – a philosophy to keep it as simple as possible, but no simpler. By focusing on what can be controlled and building off the best research in the area, the book details three simple solutions that will suit the vast majority of readers and maximize the chance of success while minimizing fees.